El Hoyazo ravine or "Rambla de las Granatillas"
The Hoyazo of Nijar is the remains of a volcano edifice surrounded by a reef complex forming a perfect example of fossil atoll. 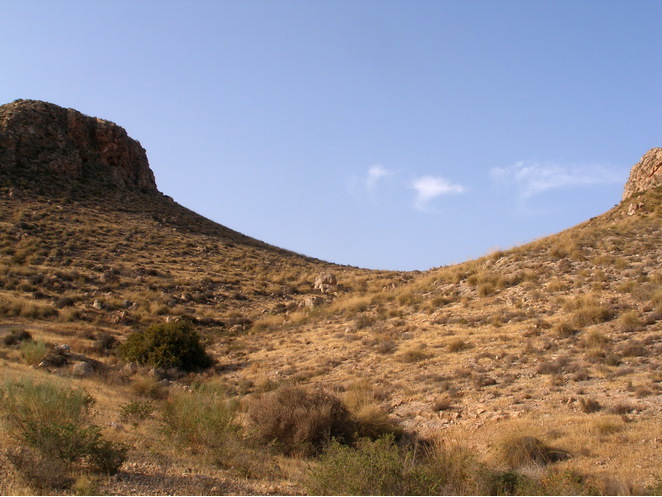 It is part of volcanism calc-alkaline- potassium of Neogene age southeastern Spanish. Its composition is very special dacitic rock (labradorite-cordierite-biotite-garnet) with numerous inclusions product of assimilation of basic intrusive rocks and metamorphic rocks. 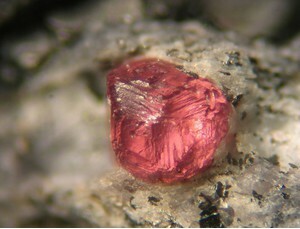 One of the most notable features is the abundance of garnets that flow from the rock and form accumulations of genuine Garnet sands (Rambla de las Granatillas). 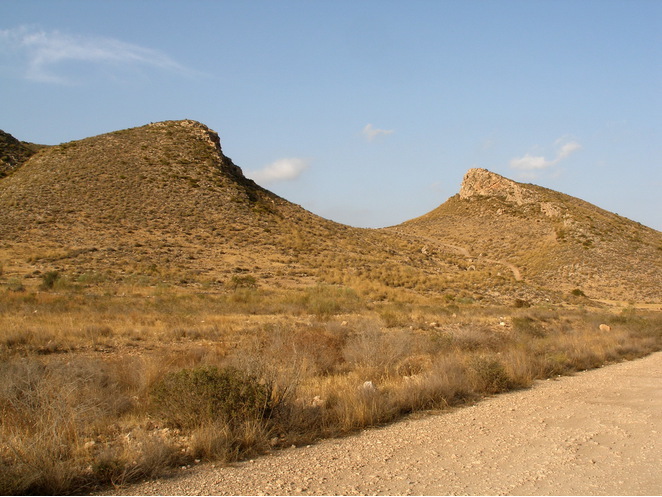 In this field most likely are the samples that were used to describe for the first time the mineral Cordierite by Von Schlotheim in 1801 calling it "Spanischer Lazulith",later with samples of the San Pedro de Pinatar (Murcia) Pierre Cordiere with the help of René Just Haüy describes again the mineral and gives its name. Reference: Calvo, M. (2018). Minerales y Minas de España. Vol. IX. Silicatos. Escuela Técnica Superior de Ingenieros de Minas de Madrid. Fundación Gómez Pardo. 767 págs. Reference: Kwak, T.A. (1971). 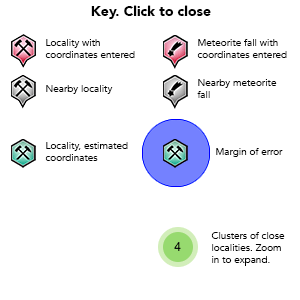 Composition of natural sillimanites from volcanic inclusions and metamorphic rocks. American Mineralogist, 56, 1750-1759. 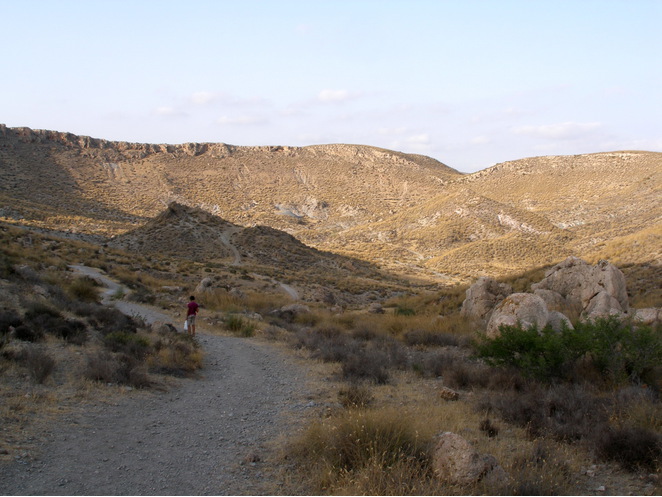 -Muñoz Espadas M.J., Martinez Frias J. y Lunar R.: Nuevos datos mineralógicos y texturales de los granates y fases asociadas del Cerro El Hoyazo (Almería) Geogaceta 30. -Calvo, M. (2018). 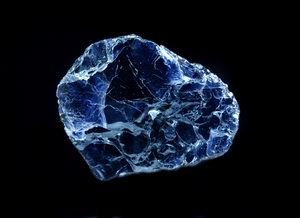 Minerales y Minas de España. Vol. IX. Silicatos. Escuela Técnica Superior de Ingenieros de Minas de Madrid. Fundación Gómez Pardo. 767 págs.